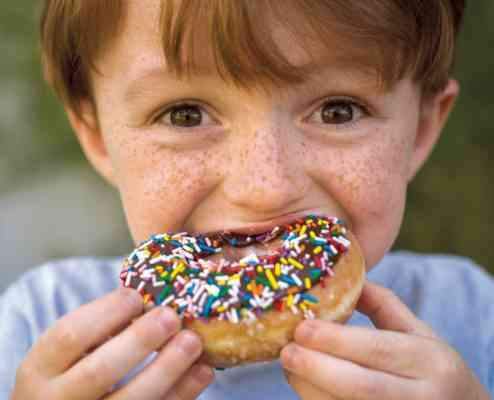 Sweet treats like a sprinkled doughnut are nutritionally deficient, not “bad.” Children can still thrive when they balance occasional treats with healthy meals. Dear Healthy Professor: My 10-year-old daughter came home from camp yesterday and told me that a child in her lunch group said cookies were bad for her. How would you handle this situation? Answer: First, I would tell her to eat lunch with another group! Then I would tell your daughter that since you provide her with a variety of nutritious foods most of the time, treats like cookies are not only nutritionally acceptable but also make a meal enjoyable. Remind her that what makes a food bad is how much we eat of it and how often we eat it. Even good healthy broccoli, if eaten in excess, could be a problem. I don't think any food is a bad food. There are some foods that come very close - giant Pixie Stixs and pork rinds come to mind - but basically what we think of as bad foods are nutrient-deficient foods loaded with calories and unhealthy fats. We just don't need them. Good foods support health because they are nutrient-dense with vitamins, minerals, fiber, protein, complex carbohydrates and heart-healthy fats. There's a Family Circus cartoon in which the littlest member of the family is looking at a cookie jar and asks, "Could I have something to eat that isn't good for me?" In my experience, talking with children about nutrition, "bad foods" always come up and I hate to hear it. Adults have to find a better way to help kids understand what's healthy for them without using the term "bad food" because it makes food take on moral character; that's dangerous because bad food becomes desired food and then we just can't get enough of it. Of course, being an example is the most powerful way to convey good nutrition to children. Constant dieting and obsessing over what you should and shouldn't eat is just as harmful as overeating. Strive for nutritional balance in your life and your children will reap the rewards. When I was a kid growing up in Brooklyn, N.Y., the corner candy store was the place to indulge in a sweet treat. I remember that before the proprietor would sell us candy, he asked us if we ate a good breakfast or had our dinner. He probably didn't know it then, but he was teaching us kids a lot about nutrition. He even went so far as to cut some of us off, telling us that one egg cream was enough for any kid. I got the message without ever feeling that these confections were bad. In order to gain a bit more insight, I sought the opinion of my 11-year-old niece from Brooklyn who is visiting me for a couple of weeks. I asked her about good foods vs. bad foods and asked her if we could think of another way to differentiate between them. She likes to say "OK food" and "better food." For example, sometimes it's OK to have cookies in your lunch bag, but it may be better to have fresh fruit most of the time. She makes her aunt proud! Nina Marinello, Ph.D., is the coordinator of nutrition education in the department of athletics at the State University of New York at Albany.